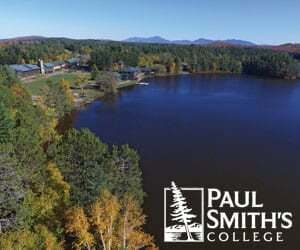 Need proof that getting universal high- speed broadband internet access in the Adirondacks is a vital piece of the region’s economic jigsaw puzzle? Just ask Suzanne Hurtado, who lives on Lost Pond. Within days of getting fiber-optic access in 2017, she was able to live video chat several times a day with students she teaches in China. 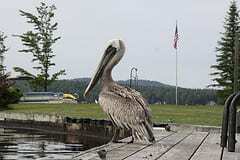 It’s a story echoed by others in Schroon Lake, according to Steiniger. Within ten days of access, he reported residents had logged into their work virtual private networks, processed applications for customers in Hudson Valley, uploaded files from their law office in Philadelphia and downloaded architectural drawings for clients. Stories like these were the exception rather than the rule just a few years ago, when only 12 percent of households in the Park had access to high speed broadband, according to a New NY Broadband Program status report in April. At the end of 2017, 91 percent of the region had coverage, thanks to Governor Andrew Cuomo’s expansive program. The New NY Broadband Program, the $500 million initiative he announced in 2015, promises 100 percent accessibility for all New York State residents by the end of 2019. Phase 2 of the funded projects is due to be completed by the end of 2018, and Phase 3 funding projects are already planned for 2019. Jeff Nordhaus, vice president for innovation and broadband at Empire State Development, said 99 percent of New Yorkers statewide will have access to broadband at speeds of 100 megabits per second (mbps) or better when the initiative concludes. The remaining 1 percent will have access at 25 mbps, which is the minimum requirement level set by the Federal Communications Commission, charged with regulating broadband. In the Park, the percentage of households served by wireless technology will be somewhat higher than the state average due to the topographical challenges of laying fiber optic lines in some areas. 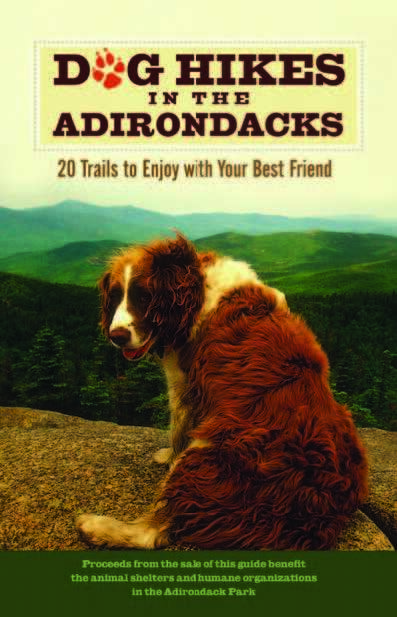 The Adirondack region is the largest funding beneficiary in the program. Forty-five projects received $150 million of state funding. “It’s a game changer for the Adirondack Park,” said Nordhaus, who oversees the New NY Broadband Program. Most homes in the Tri-Lakes area already have high-speed internet of at least 100 mbps. Other parts of the Park are in flux. Long Lake has been adding this level of service, while providers in North Creek and Newcomb aren’t there yet but have state awards to install high-speed to many homes by the end of next year. The governor’s battle with Charter Communications and its Spectrum internet brand has not slowed the progress, despite his claims that the company has lagged in serving rural areas. State grants have flowed into upgrades in and around the Park. In a region where large-scale development is not a likely economic driver, enabling more people to work remotely from the mountains could be key. The need for improved broadband access was recognized by many Park business leaders long before the Cuomo administration stepped in. The North Country Economic Regional Development Council (NREDC) made broadband one of eight critical strategic initiatives necessary for economic success in its regional strategic plan eight years ago, said Tony Collins, president of Clarkson University and co-chair of the group. The 2017 annual report noted that the council has supported fifteen different broadband-related projects, which have resulted in 2,181 additional miles of fiber. These projects reached 249 municipalities and benefitted 12,391 households. While leaders and politicians debated what could happen, some Park residents took matters into their own hands. Dave Mason was a multi-generational Adirondack summer resident before he and his partner, Jim Herman, moved to Keene full-time in 2004 from Boston. With experience in the tech industry, they decided to work with Keene Valley Video & Internet, a local business, to build a fiber network. “Our goal was to connect as close to 100 percent of the town as possible and we wanted to get 100 percent of students and teachers on high speed as part of their home life,” Herman said. They pulled together funding from a variety of sources, including donations from local seasonal and full-time residents. The project, which took from 2006 to 2011, ultimately refurbished the aging existing coaxial network and built out fiber-to-the-home technology into major new areas of the town. Today 90 percent of all homes and businesses in Keene can get broadband internet access (97 percent for year-round residences and businesses); every home with a student or school staff person is connected, and service speeds and reliability have increased significantly, according to the project’s final report. Forty-two percent of the funds needed by this project were raised from private donations while $100,000 came from state grants. Telecommuter David Craig has lived this Keene upgrade. 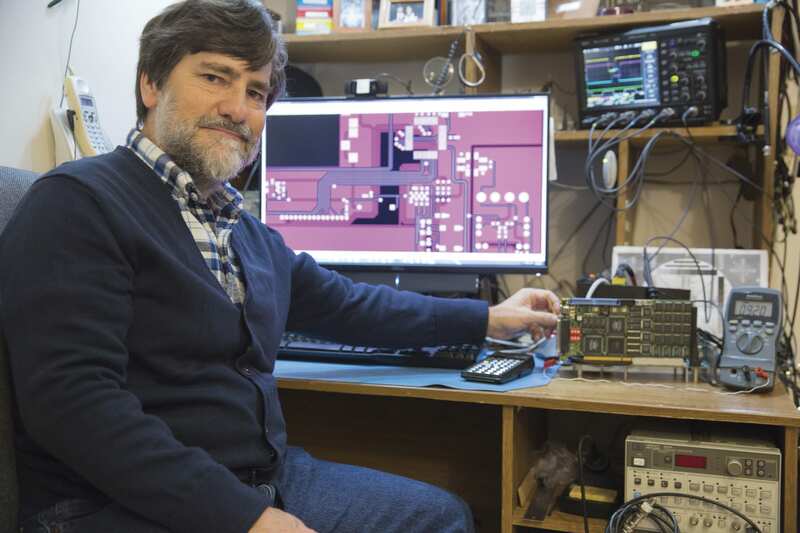 An electronic engineer for MIT’s Lincoln Labs in Massachusetts for the past thirty-eight years, Craig has been telecommuting from Keene since the dawn of dial-up eighteen years ago. “It was pretty painful,” he said of those initial telecommuting years. Fiber-to-the-home may be the gold standard, but topography and population density make that a financial impossibility for some Park residents. For those people satellite may be the only option. 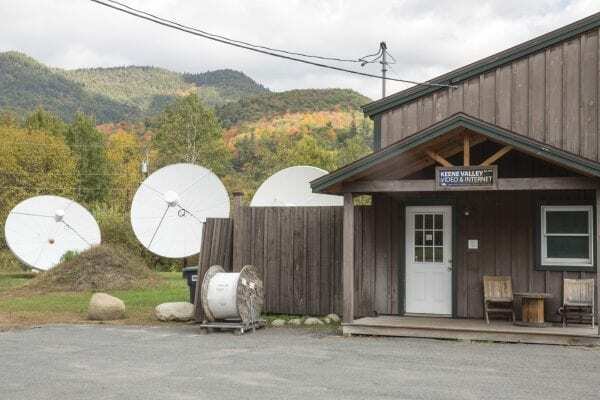 Hughes Network Systems is the satellite company that received program funding to connect the 72,000 Adirondack homes, less than 1 percent of the total homes that fall into this category. Satellite coverage does provide the minimum speed mandated by the FCC, but beaming data to fixed satellites about 23,000 miles in space obviously is not ideal. “It takes time to go from your house to the satellite and bounce back,” said David Wolff of ADKAction, a nonprofit dedicated to preserving and improving the Adirondacks. There’s only so much physics can do. Mobile phone service also can help or hinder Park-based business. 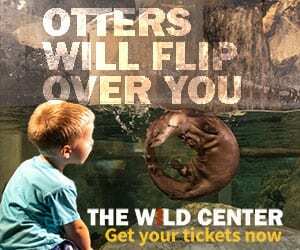 “It’s a major issue for tourists,” Wolff said. “They come to the North Country and they want to be able to use their cell phones.” Regardless of carrier, there are miles of dead zones in the Park. Public safety is an additional concern. Dead zones mean that those in distress can’t access help. Verizon did close the cell tower gap on the Northway in 2015 in part after a public and political outcry after a man died of hypothermia in his car in 2007 because neither he nor his wife could call for help, but dead zones remain. Lynch said it’s possible that the new fiber infrastructure could help with cell phone service down the road. Wireless companies could use existing fiber networks to build shorter towers, which can lower their costs and enable them to place more towers. In the meantime, residents are at the mercy of the mobile phone companies. ATT spokesperson Brandy Bell-Truskey said ATT invested nearly $1.3 billion in New York State wireless and wired networks from 2015 to 2017. While she would not provide the number of ATT towers in the Park or their location, she did say some of the improvements were in Lake George village and parts of the Northway. 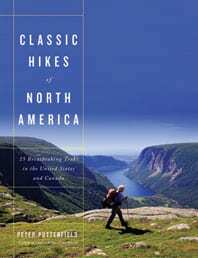 No 'Classic Hikes' in Adirondacks?